Seasonal, yes. It's that time of year. Yellow shaded warm breezes. I swear, I never had them until 2006...the year we moved down here. And it seems like they've gotten worse each year. Spring and Fall, doesn't matter here. And this year, we have an early Spring...we've had temps in the 80s for maybe 3 weeks. We hardly had a winter and in fact, did not have enough of a hard long freeze to kill down the insects. WAHHHHH! It's going to be pestilence this year. Sigh. Gnats. Mosquitoes. Roaches probably. Gag. Yes. I love Spring. I do. I used to get Spring Fever so badly during school, that my grades would usually slump. I would stare at the blue sky out of the classroom windows if I could. In college, I definitely played hookie, usually with my best friend; we'd drive off somewhere in my car, grab lunch or some frozen yogurt or coffee, and just go sit somewhere w/ the windows down, the music on, sometimes in silence, or sometimes in deep conversation. (Yes, Cindy I sometimes long for those days again :) Or just to have them here and there NOW.) But, too, I loved the smell of the flowers in bloom. 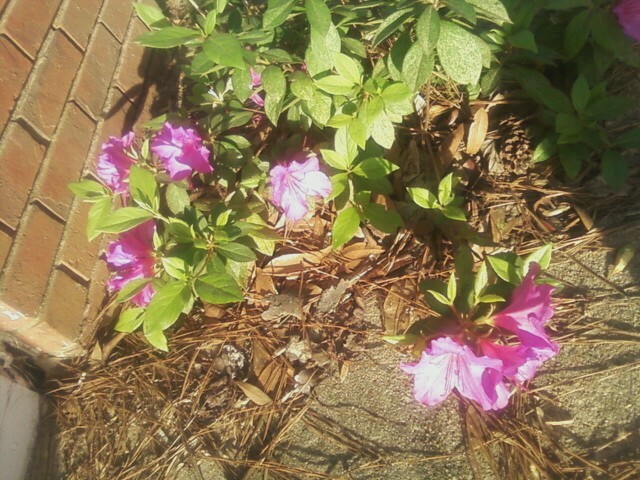 The azaleas that the South is so well known for. The wisteria was and is a favorite (though bees swarm to it LOL.) And I see all of it abloom now.... in fact, we have one tiny azalea bush at our new home, beside the garage. UPDATE: allergies have been getting better this week, but...bad news is, I am pretty sure some of that what I thought to be sinus-pressure is rather my tooth hurting me :( I had this bad tooth that had started to chip...and finally broke...it didn't hurt me though...even though it's broke up to the gum...it's on the side, so thankfully not obvious to the world, but I thought I was going to get to coast along...continuing my 8 yr long (wow time flies! sigh) avoidance of the dentist (another post for another time, related to my PTSD and fear) .....but if this keeps up and/or gets progressively worse...I may have to break down ...and that scares the dickens out of me!!!! SO I ask for prayers for my tooth....may my pain go away like Doug's did with his LOL It sort of radiates along the whole side of my face, up toward my ear... just one ibuprofren or tylenol won't touch it....sigh.